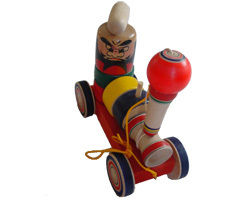 This toy ingeniously incorporates the two classic Japanese games kendama and daruma otoshi. With the games mounted on a small car, this makes an ideal toy for children of all ages. Two Classic Games in One! Daruma otoshi - place the daruma head on top of the wooden disks, knock out the bottom one with the wooden hammer and see if you can keep the head cleanly on the remaining disks. This daruma is based on the legendary warrior and swordsman Benkei. Made in Japan from non-toxic materials.